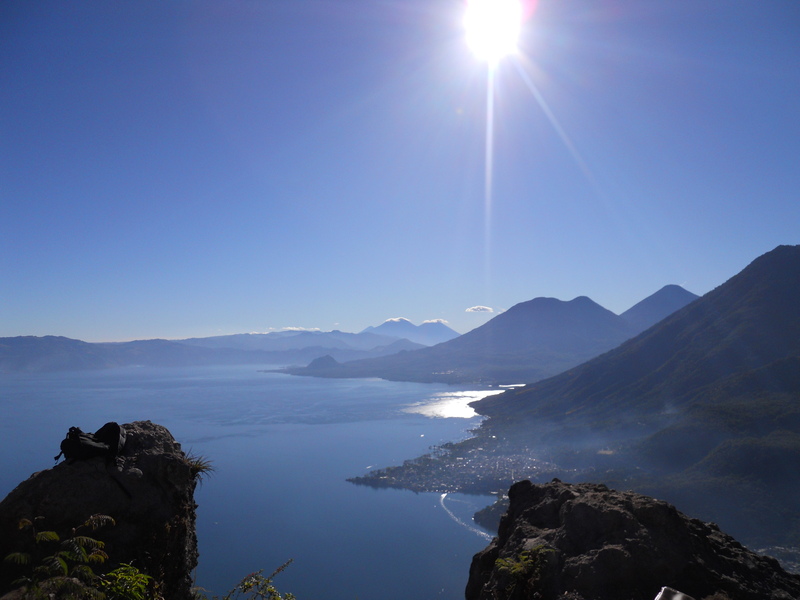 It was a cool sunny morning when we made our way up the hills surrounding Lago de Atitlan towards the village of San Pablo where we were to meet the shaman. The increasingly few Mayan shamans living around the shores of Atitlan, knowing in Mayan as “the place where the rainbow gets its colors” dress and live largely the same as anyone else. Ours wore a Hollister shirt and blue jeans – typical for most Guatemalan men thanks to the overproduction of tween American clothing brands. However, despite any appearance to contrary, Pablo was very much a shaman. Pablo’s home, brick with earthen floors, was composed of three rooms; a small bedroom which the entire family shared, a slightly larger center room which served as kitchen, bathroom, living room and chicken coop, as well as a small workshop where Pablo and his brother constructed traditional Mayan drums of local woods. Three-hundred Quetzales paid for an average sized traditional shamanic ceremony and while Pablo gathered supplies, we sat watching his brother patiently hollowing out a drum from a tree trunk. Twenty minutes later, our shaman returned with two large stuffed sacks and we left San Pablo via footpath carved into the steep banks of vast lake Atitlan. After a half-hour hike up steep, treacherous trails we arrived at the first stop on our journey. High up on the rim of the volcanic cauldron that created the lake was a rock outcropping. Several minutes of verbal induction led into a drumming ceremony performed on the hollow stone we were circling. This spot, as well as the temple we would arrive at shortly have long been considered sacred to the local Mayans. In traditional Mayan belief, the afterlife and spiritual world are contained largely underground. Hence, caves or hollow rocks are considered holy as they offer a gateway to spiritual world. Through the next phase of induction we were directed to stare up at the bright blue sky. Possibly illusion, possibly magic, we saw dark and light spots raining down from stratosphere above. “Herbas” Pablo termed them and in slow, deliberate Spanish understandable to our novice ears, he explained the shamanic ceremony’s purpose of cleansing the soul and reconnecting it with the natural and supernatural world. Pablo explained in great detail the symbolism of each prismatic color, cardinal direction, traditional chant and how each one was very integral to the ceremony. However, before we can begin the hike to the temple we are instructed to meditate for ten minutes to clear our heads and make mentally capable the absorption of the shamanic ceremony soon to take place. Feeling the gusting breeze chilled by the lake’s cold waters, while gazing out at the ring of volcanoes bordering the vista, our minds easily fell into a state of serenity. Now very relaxed, we made the short walk to the temple where Pablo prophesized our three souls will become one. The temple, nothing like the small catholic and evangelical churches in the village below, was sculpted not by human hands but by the rushing lava and shaking earthquakes of millennia past. It is composed of a shallow cave, surrounded on three sides by cliff and hemmed in by a large sulking tree on the fourth. Its walls have been stained black by centuries of ceremonial fires. The ground is scattered with ash and painted in a flowing kaleidoscope of varying colors made from the wax of previously burnt offering candles. Locals have also left an array of offerings for the spirits, most notably small flasks of rum and cigarettes. Pablo opened the two large sacks he’d brought from San Pablo to revealing an array of incense, candles, colored sugar and green liquor. The first phase of the ceremony began by lighting hand-pressed incense disks wrapped in a tube of maize husk then lighting and placing a dozen or more colored lit candles on the altar of the cave. Again he reviewed each color’s significance, brown symbolizing earth, blue was for water and sky, white indicated purity, and so on. For the next hour, Pablo gradually fed the altar’s fire as he sang and chanted in the traditional language of Quiche Mayan to the sounds of a drum. The only words understandable to us were the names of our recently deceased grandfathers, or our closest connectors to the spirit world. The temple was such that the thick fragrant smoke hung in the air with little room for escape. As the smoke grew, the cave and particularly the candles placed at the back of the altar seemed to deepen and expand. More and more it appeared that we were staring into the gates of an abyss. The fire itself rose and fell as colored liquor and dyed sugars were spread across it. The lines of reality began to blur as the mind fell deeper and deeper into a hypnotic state fueled by the powerful smoky haze and melodic chanting. We began to close the ceremony by individually giving thanks to both Madre Tierra (aka.,Mother Earth) and Jesus (there is a curious duality of traditional belief blended with Catholicism). Final chants by Pablo in Quiche, followed him blowing into the fire with all his strength concluded the ceremony. He elucidated that he was speaking directly to Tierra Madre, asking that she help us understand our innate connection to the earth as well as providing us safe travels. Departing the cave, I felt a calmed fulfillment quite unlike anything I had ever experienced. Prior to the ceremony, I had anticipated the event as being intriguing in an anthropological and perhaps even voyeuristic sense, which it was, but I certainly didn’t expect the deep, almost primal connection to earth and the past which the ceremony stirred up in me. Perhaps, it was just the otherworldly surrounding and scenery of Atitlan itself combined with rich sound and mildly poisoning smoke inhalation that precipitated this sentiment. However, there was a rawness to the ritual that made me feel a part of an ancient continuum as old as the volcanoes themselves. Unfortunately, this continuum may soon fade into a forgotten past. Evangelical Christianity may very well put an end to practices which have miraculously been preserved through conquistadors, enslavement, civil war, and genocide. While Catholicism made room for indigenous people to incorporate their traditional beliefs into their new found faith, the American evangelical preachers who have recently spread throughout the highlands have no patience for such blasphemy. Shamans are considered devil worshippers and those participating in traditional rites are considered backward and sinful. The disappointment was visible when Pablo told us how fewer and fewer villagers visited the temple. It appears increasingly unlikely that one of the local youths would want to carry on the practice. If this is to be the case, hundreds of years of accumulated (and often undocumented) knowledge and tradition will be gone forever. Also, the true shame of this comes with the community’s loss of traditional health care. Instead of going to Mayan healers, who use the local plants to cure ailments (the ingredients in these plants are often found to be identical to manufactured pharmaceuticals), they now travel great distances to doctors who prescribe medicines they cannot afford. As healers and shamans die out without passing on their teachings, science and medicine lose the practical knowledge gained over thousands of years which may hold the key to solving some of the world´s most common and deadly ailments.